Performances are April 12 - 28. Friday and Saturday performances are at 7:30p*. Sunday performances are at 2pm. There is a performance on Easter Sunday. The hilarious backstage farce "Moon Over Buffalo" centers on George and Charlotte Hay, fading stars of the 1950s. Just as their tour of Buffalo, NY is about to come to a disastrous end, they get word that Frank Capra is coming to town to see them for a shot in his next big movie. Of course, everything that can go wrong does, including a visit from their daughter's clueless fiance, and confusion about which play they are actually performing. 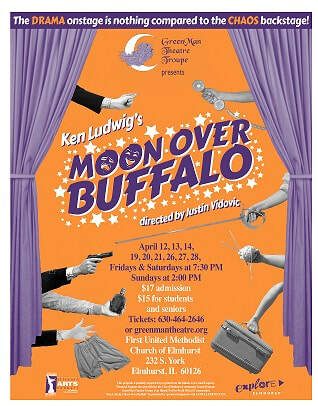 * GreenMan Theatre has just been informed that due to Good Friday programming at our venue we must delay the start time of the Friday, April 19 performance of "Moon Over Buffalo" by 1 hour. The show will now begin at 8:30 pm instead of 7:30 pm. The running time of the show is a little under 2 hours including 1 intermission.